Sonya Blacker began her Mid-East dance journey in April 1996, and has compared it to catching a "belly dance flu" - she found it was the first thing in her thoughts every morning and the last thing she pondered each night. Sonya began teaching in 1999 at her mentors behest, and found it to be the most rewarding aspect of the art form. Sonya was a principle dancer in "Ward el Sahara" Dance Company & performed over 35 theater shows in her first 8 years, showcasing folkloric, traditional, cabaret, and themed or interpretive Mid-East dance, fusing her study of Tahitian, Polynesian, & Bollywood/East Indian with flavors of Oriental & Andalusian dance. Sonya founded Arabesque Dance & Fitness in 2004, herself a multiple Award-Winning belly dancer, and sought her certification from Mahmoud Reda in Cairo Egypt 2006 (after her 10th year of dedicated study). She was looking to offer the dance community a choice for open & honest sharing of this beautifully sacred art through dance instruction and performance opportunities for adults. Sonya's belief is that dance lessons should offer quality instruction as well as FUN, so she strives for good communication between instructor and student so that the student can be excited about their progress. Every single student is different & that is an important spice of life. A lifetime student, Sonya is a firm believer in furthering her own education & experience by taking and teaching seminars across the globe, believing we always have more to learn in this rich, cultured art form that brings expression, pride, & joy to hundreds of dancers each year. Most recently she became certified in levels 1 & 2 of Hadia's teacher-training (focused on anatomy & musculature of movement) as well as levels 1 & 2 of Sahra Saeeda's "Journey Through Egypt" (focused on the history, traditions, geography, and religious/political aspects of Egyptian dance). After 6 grueling years "gigging" in the restaurant/nightclub scene & performing at private events all over, Sonya realized she could share her love of performance with 6 revolving-member student troupes. She loves to see her choreography come to life with her beginner troupe "Enta Albi" (Arabic for my heart), her intermediates in "el Amar" (the moon), her finger cymbal loving troupe "Killer Zillar", as well as her advanced troupe "Ro-He" (soul). When the occasion arises for fusion Sonya calls upon her troupes "Fitnah" (feminine chaos) & gothic belly dance troupe "Arabella" to answer the call, without confusion of what is authentic & what is fantasy. Choreography - The Discipline of Mind & Body. Arabesque classes focus on the individual, with technique over choreography in goal. Not just leaning a dance, but how-to dance. Classes always begin with a warm-up to get your heart going and lubricate the joints, followed by isolation training for precision, then instruction in the basics of the steps, then move to more polished combinations (followed by options for clean layering in the more complex classes) before a cool-down stretch. Sonya begins by demonstrating the move or combination, then breaks it down into its parts. Students would then have the chance to practice the elements slowly without music or half-tempo, and finally up to speed with music. Drills improve stamina, & individual attention is given, with variations to accommodate differences in students if need be. 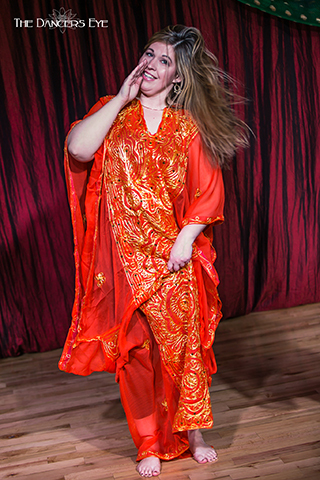 Eliza fell "head over hips" in love with belly dance in 1998 after seeing a performance by the ATS (American Tribal Style) troupe Fat Chance Belly Dance in San Francisco. Captivated by the fluidity, strength and camaraderie of the dancers, she began studying with Chicago based Read My Hips where she served as a principal dancer from 1999 to 2004. In 2005 she co-founded Jezebelly Tribal Belly Dance which continued in the tradition of Improvisational Tribal Style (ITS) belly dance. In 2009, Eliza began performing as a solo artist. 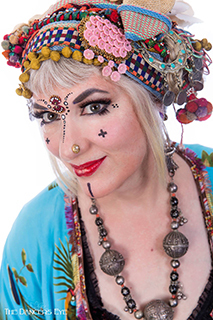 With an intense interest in developing her technical and interpretive dance skills as a soloist, she has taken advanced and teacher level intensive workshops in both tribal fusion and traditional belly dance styles. She received certifications in 2010, 2011, 2014 and 2015 from The Tribal Massive, a week-long intensive training with some of the top fusion dancers and instructors in the world including Rachel Brice, Zoe Jakes, Mira Betz and Heather Stants. Eliza joined the teaching staff at Arabesque in 2006. She offers instruction for intermediate and advanced level students in Modern Fusion Belly Dance (MFBD) which combines or "fuses" movements of traditional belly dance with elements of western dance formats. 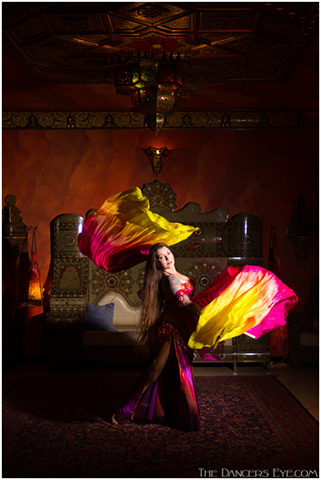 Eliza strives to honor traditional belly dance while also integrating contemporary, jazz and a bit of show girl to create fresh movements and unique choreographies. Eliza is also the director of the modern fusion troupe Spellbound which includes dancers from her advanced level class. 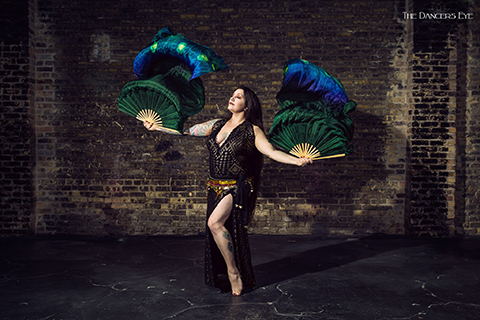 Eliza enjoys being a part of the Chicago belly dance community and is involved in local and regional events, performances and workshops in her quest to influence and be influenced by the broader belly dance community. Eliza was originally drawn to belly dance because it is one of the few dance forms where an adult can begin with the basics and continue to master the art of the dance throughout adult life. 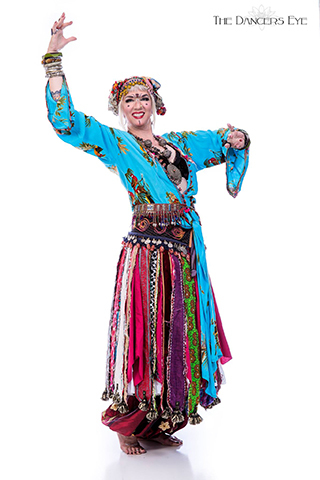 She was also originally drawn to the group improv styles of belly dance because of the positive support and camaraderie that she found in that dance form. In her classes, Eliza continues that philosophy by providing a positive and safe space for dancers to explore movement and discover the wonders that the body has to offer through belly dance. Classes starts with a short warm up to improve flexibility and get muscles and joints moving followed by exercises and drills that strengthen and tone primary muscles used in dance practice. Emphasis is placed on proper posture, fluid and concise movements and seamless transitions. Technique drills are integral to priming the body to move in new and exciting ways and to lay the groundwork for mastery of the dance form. A restorative cool down caps off classes as a reward for work well done. 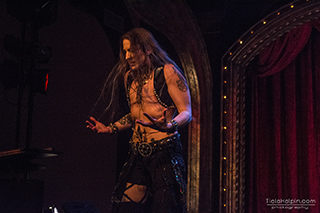 Kamrah is Chicago’s first trans masculine belly dancer. 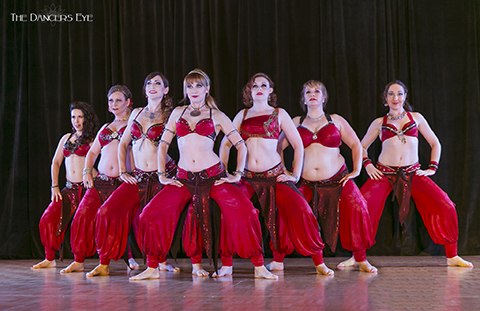 They have been dancing since 2001, and have traveled all over the country to teach and perform in multiple styles of belly dance. 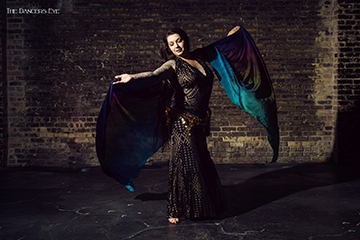 Kamrah is known for their killer isolations, creativity, and theatrical pieces, and for being a soloist in Chicago’s premiere geeky belly dance and fire troupe, Raks Geek. They have produced their own DVD, Killer Isolations, and have taught at such festivals as Tribal Fest, Waking Persephone, Tribal Revolution, and more. Kamrah is dedicated to the safe and effective practice of belly dance, and passes their knowledge as a scientist, a martial artist, and massage therapist on to their students. 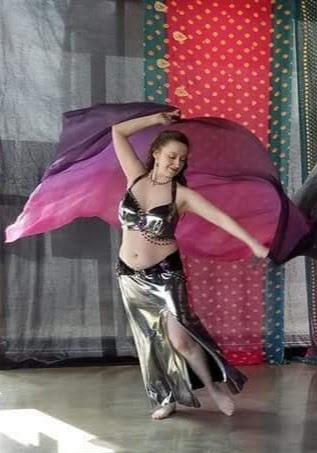 Christiana first discovered belly dance while attending a friend’s performance at a suburban festival, but it wasn’t until 2007 when she finally took her first class at Arabesque. Immediately hooked, Christiana began to study Tribal (ITS and Fusion) and Orientale styles of belly dance. Today, she continues her studies in these styles under mentors Sonya Blacker and Eliza Perry. Her life-long passion for dance has led her to study various dance styles throughout the years including hip hop, burlesque and 11 years of ballet, tap and jazz. Christiana strongly believes in continuous learning and expanding one’s dance vocabulary and experience, no matter what the discipline. She has completed multiple Tribal Massive Intensives, as well as Levels 1 and 2 of Journey through Egypt. She is currently studying under Rachel Brice’s 8 Elements Program and Zoe Jakes’ DanceCraft Program. In addition to these instructors, other inspirations and influences include Ariellah, Aziza, Mira Betz, Kami Liddle, Mardi Love, Mahmoud Reda, her mentors and her peers, and most of all her students. 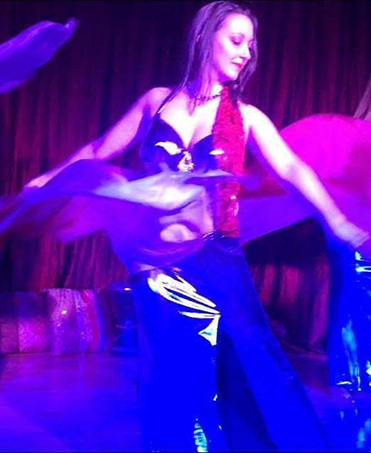 Christiana enjoys performing for all types of audiences, especially those that are unfamiliar with belly dance. Her passion for dance drives her to perform regularly as both a soloist and with several troupes (Sonya’s RoHe, BellyRing, Sabahaat and Spellbound) and collaborative projects. Lisha has been dancing since 2003, when she first stepped into one of Sonya’s beginner classes. She quickly became enchanted by the music and movements of this dance. Lisha feels anyone can gain competence and confidence in this dance if they are willing to work at it. She began teaching weekly classes at Arabesque in 2008. 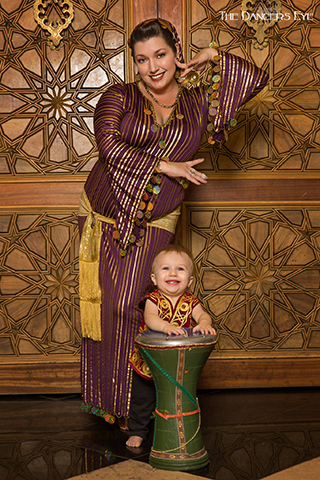 Lisha strives to educate her students in Middle Eastern Dance history as well as proper posture, technique and an emotional connection to the music. She believes all of these things are integral to becoming a well-rounded dancer. She also offers a workshop series called “The Dancer’s Playlist” to help students become familiar with important songs bellydancers should know. Lisha is passionate about vintage Middle Eastern music and dance, especially as represented in Egyptian films of the 1940’s through 1970’s. Her biggest influences from these films are dancers Tahia Carioca, Katy Loutraki, and Samia Gamal. Contemporary dancers she has studied with and greatly admires are Yasmina Ramzy, Aziza of Montreal, DaVid of Scandinavia, Sabah Saeed, and Sonya Blacker, who has been her mentor since the beginning. She hopes to inspire her students to learn as much as they can about this misunderstood art form, honor its history, and find their own path in the dance. 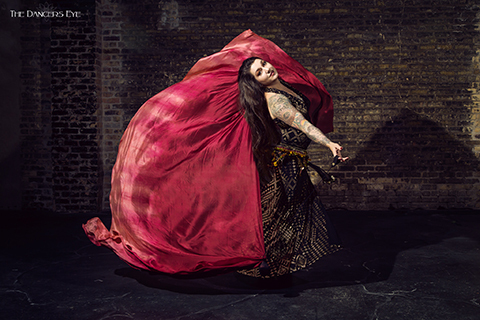 Eva la Feva is a nationally touring burlesque and belly dance performer/producer that has been delighting audiences for over a decade with her fluid, stylized dance technique base and her emotive and theatrical approach to burlesque. In Chicago, Eva is regular performer at Untitled, The Drifter, House of Blues, and as part of the dance collective Fringe Factor, directed by Lindsey Marks/Lady Jack. In addition, Eva helped co-found Burlesque Community Against Unsafe Spaces (BCAUS) in 2016, a community action group designed to foster safe spaces in the Chicago burlesque scene. In 2016, Eva was awarded the Judith Stein scholarship to the Edmonton Burlesque Festival. Eva's belly dance credits include being cast in the internationally touring show Bellydance Evolution (Washington, DC and New York, 2010), earning second place in the MAQAM Belly Dance Challenge (Pro Tribal Belly Dance Soloist category, Chicago 2009), and performing as a backup dancer for Bollywood star Shefali Zariwala in 2012 (Chicago). She was Level II certified in the Suhaila Salimpour format from 2009-2011. 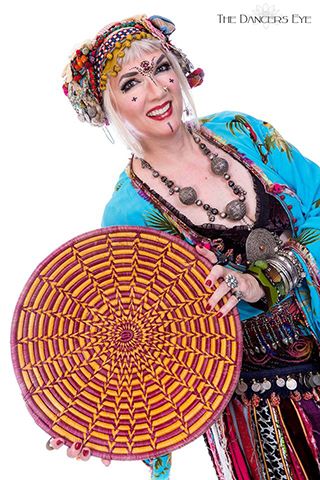 Hanan is an instructor of tribal cued improv bellydance, a form that originated in California in the eighties. It is uniquely American in origin, although the steps and dance isolations are informed by dances of the Middle East and the Romany Trail. Hanan’s deep training is in American Tribal Style®, a trademarked format whose founder, Carolena Nericcio-Bohlman, is still active in the San Francisco scene. This dance is meant to be performed primarily in groups; it has a parallel to jazz in music, in that it changes both form and leadership on the fly. The same song will not always elicit the same steps! 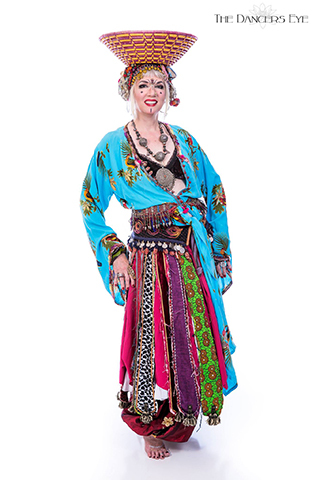 Hanan holds certifications in American Tribal Style bellydance, both the General Skills and Teacher Training. She was one of the first three certified teachers in the style in the Chicago area. Hanan studies regularly with other teachers to continue improving her own skill set, with the belief that all dance informs bellydance! Bridget had always wanted to try belly dance, and in 2007 she decided to give it a try at Arabesque. She instantly fell in love, and shortly thereafter had a chance to perform as part of troupe Enta Albi. She spent the next years studying with many instructors as Arabesque, including Sonya, Lisha, and Jonsey. She enjoys the challenge of learning new choreographies and props while deepening her own knowledge and skill at her home studio, and has been an active member of troupe Ro-He since 2012. A personal highlight came in 2014 when Bridget was able to study with Hossam Ramzy and perform for him with troupe Ro-He to his own compositions. In 2015, she performed her first solo choreography with mentor help from Sonya and her Semi-Pro class. Bridget is excited to introduce new students to a dance form that has made her feel accepted and inspired. She looks forward to welcoming others to her "home away from home" with a little humor and fun as they learn together. Inspired by her Armenian-Lebanese roots and passion for dance since childhood, Rose embodies the true heart of Raqs Sharqi (Arabic for "Eastern Dance"), aka "belly dance," engaging in the traditional art of improvisation – becoming one with the music in the present moment. An international, lifetime performer of 500+ shows and counting, Rose has over 20 years of dance training and 15+ years’ experience as a teacher & choreographer of multiple styles. Rose's technical skills are underpinned by decades of training in ballet, jazz, and modern dance, as well as various somatic practices to awaken internal awareness, including movement improvisation, Pilates, and yoga. In addition to these and other forms, Rose has studied Middle Eastern dance – primarily Egyptian & Lebanese Raqs Sharqi, Lebanese & Palestinian dabke (folk dance of the Levant), and Iraqi Kawliya dance, among others – with masters across the globe. These include Sonya, Angelina (the protégé and daughter of Dahlena), and Surayah Al Muddaris in Chicago; Caracalla Dance Theatre, Pierre Haddad, & Helena Cremona (students of the legend Nadia Gamal), and Michel Traboulsy (Danza Dabke Group) in Lebanon; Shahrzad of Cairo, Khyriya Mazen (Ghawazee), Mostafa Booriy (Saidi Raqs Assaya (Upper Egyptian cane dance)), and Ahmed Awedony (Nubian) in Egypt; and renowned Iraqi dancer Assala Ibrahim, among others, in Europe. 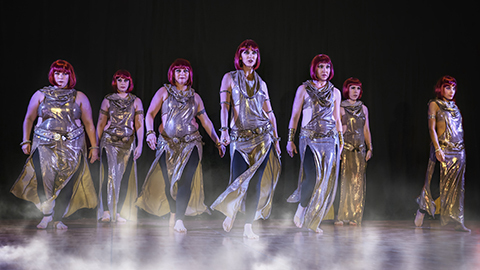 Rose strives to create culturally sensitive and authentic Middle Eastern dance pieces, bearing in mind – and sharing with her students – the region of origin and meaning of the songs she uses, aided by her family, translators, and her own research. Rose completed her level-four certification in Journey Through Egypt – a dance ethnology program led by the internationally-recognized anthropologist, Sahra Saeeda, M.A – in 2018, traveling to Cairo, Luxor, and Aswan, Egypt to study the arts, customs, and history of these culturally rich areas in the flesh. Independently, Rose similarly studies her father’s native Lebanon, periodically visiting to deepen her understanding of its diverse regional traditions, as well as Raqs Sharqi and dabke. Rose’s love of Middle Eastern culture goes beyond her dedication to preserving the dance and music alone; Rose also studies the Arabic language, which she speaks, reads, and writes at a beginner level. Rose absolutely loves sharing her knowledge of Middle Eastern dance, music, and culture with her students, and is so honored to be a part of the staff at her beloved home studio, Arabesque Chicago. Rose performs, often to live music, at restaurants and hookah clubs across Chicagoland every week, as well as at private events – including weddings, birthday parties, and corporate events – throughout the country on a regular basis. Rose has also performed with renowned musicians in Cairo, Luxor, and Aswan, Egypt. Her repertoire includes Raqs Al Shamadan (candelabra headpiece), Saidi Raqs Assaya (cane), finger cymbals, wings, veil, and veil-poi/voi, as well as the zaffe (wedding procession), dabke, and Khaleeji, and Iraqi (Kawliya) dances. Follow her on Facebook and Instagram to find out about her weekly shows! With 25 years of ballet under her belt—as well as experience in tap, jazz, swing, and other dance forms—in 2016 Hayley finally got to try one she had always wanted to explore: belly dance. At Arabesque she found a new dance home under the tutelage of Christiana, Kamrah and Sonya, and has also taken advantage of workshops with Jill Parker, Michelle Sorensen, and Mardi Love. 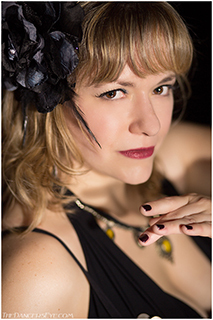 Hayley has performed in El Amar and Ro-He troupe pieces, and with Kamrah's student troupe, Ahsena, at such events as The Glint, Tribal Revolution, and the Chicago Pagan Pride Festival. 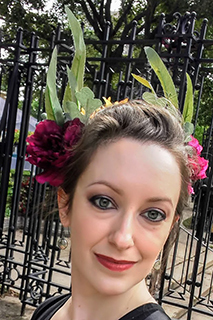 Interested in both Tribal Fusion and Orientale forms of belly dance, Hayley looks forward to growing as an artist and instructor at Arabesque. She firmly believes that dance is for everybody and looks forward to welcoming students into new and gratifying art forms and challenges. Web Design and Construction by Greg Blacker. Please direct any website-related questions here.